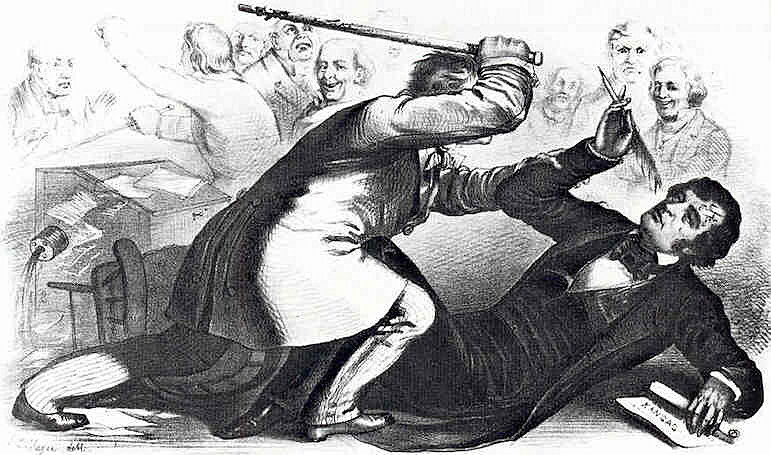 In 1856, South Carolina Rep. Preston Brooks savagely beat Sen. Charles Sumner, of Massachusetts, in the Senate chamber. There was no Rule 19 then. Three days earlier, Sumner had referred to another senator as a “noise-some, squat, and nameless animal.” So the rule is a good idea, even if it was wielded clumsily by Sen. Steve Daines. I know my colleague David Crisp has already written about Sen. Steve Daines’ role in silencing Sen. Elizabeth Warren on the floor of the Senate, but David’s piece was published on Wednesday. That same day, state Rep. Jeff Essmann of Billings, chairman of the Montana Republican Party, also wrote about the Daines-Warren incident in an op-ed for the Billings Gazette. Essmann’s piece was so crowded with misstatements and misleading information that it demands a response. The jumping-off point for Essmann’s guest editorial was a column by Gazette editor Darrell Ehrlick, published on Feb. 9, in which Ehrlick characterized Daines’ actions as “shameful” and “un-American,” among other things. But Essmann did not write to accuse Ehrlick of hyperbole. Instead, he spent half of his op-ed making the bizarre claim that Daines was right in silencing Warren because “partisan gridlock” is ruining the country. There’s a lot to unpack there, but let’s try. First, if the “real issue” is partisan gridlock, why invoke Senate Rule 19, barring senators, on the floor of the Senate, from imputing to another senator “any conduct or motive unworthy or unbecoming a Senator”? If the Democrats really were engaging in delaying tactics during the confirmation process and there was no procedural way to fight those tactics, why is it honorable to invoke an entirely separate, rarely used rule to get the job done? Any reasonable interpretation of Rule 19 is that it was intended to keep floor debates civil and peaceful. But the occasion was not a debate between senators. The occasion was consideration of having Sen. Jeff Sessions leave the Senate to join Trump’s cabinet as attorney general. Next is Essmann’s statement that the American people, in the recent election, “spoke out loud and clear for a new direction in Washington.” Considering that Hillary Clinton won 48 percent of the popular vote to Donald Trump’s 45.9 percent, I would argue that Trump’s mandate was rather muted and muddy. Then there is Essmann’s contention that American voters want a government that “works for the people and not the other way around.” But one reason this confirmation process has dragged on is that so many of Trump’s nominees are billionaires with financial entanglements that reach into every corner of society. If there was ever a time for careful deliberation and close scrutiny of Cabinet nominees, this is the year. We do need to make sure that Trump’s people intend to work for us and not their own business interests. That should not be a partisan issue. I also found it interesting that Rule 19 specifically deals with imputing unworthy motives to a senator. Essmann is not bound by that rule, but to say, as he did, that Warren was “trashing the integrity of another senator to promote herself, her book and her political ambitions,” is to trash her integrity and to make claims that he cannot begin to prove. That argument would carry some weight if Essmann—or Daines or Senate Majority Leader Mitch McConnell—had been a fraction as critical of Donald Trump’s vile, juvenile outbursts as they were of Warren. Two days before Daines silenced Warren, Trump, speaking to a gathering of sheriffs in Texas, was told of a Texas state lawmaker who was opposed to seizing the assets of drug dealers until they had been convicted—a fairly conservative, constitutional stance. Trump the tweeter has shattered every rule of decency during his short time in office, but this threat to destroy the career of a principled state legislator was shocking even from Trump. If the middle-schooler-in-chief is the kind of leader people wanted, and, seeing him in action, continue to want, a little indecorum on the floor of the Senate would seem to be the least of our worries.